Welcome to the Advantage: Pitchers Event! The newest Diamond Dynasty event in The Show 17 will be the Advantage: Pitchers Event. Assemble a team of hitters who have 50 Vision or below and any pitchers you want. The event allows Diamond, Gold, Silver, Bronze and Common tier players, and your team overall can go as high as 85 OVR. This Event requires hitters with a Vision attribute of 50 or below. In addition, the minimum overall for any player is 60 OVR. This is the first time an Event included an OVR floor to challenge your teambuilding skills. Press Triangle on a player item in your Inventory, Community Market or Ticket Counter to view the attributes. 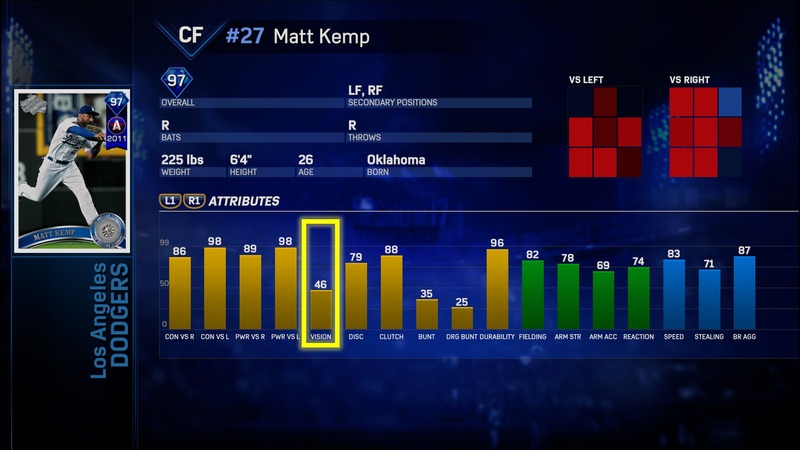 All-Star Flashback Matt Kemp qualifies for this Event because he has 46 Vision. 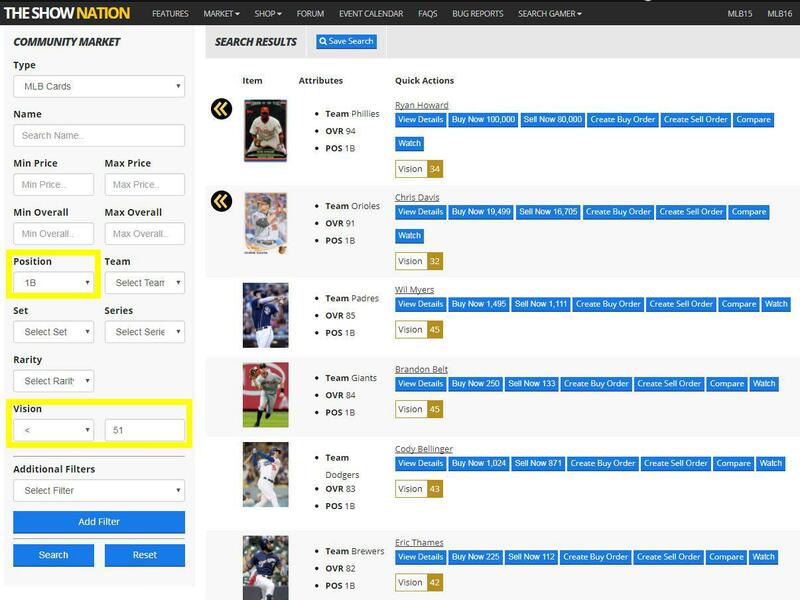 You can filter the Community Market on TheShowNation.com by position and for specific attributes. Click on the “Additional Filters” dropdown to find the Vision attribute. In the example below, we filtered for first basemen with Vision less than 51. The Advantage: Pitchers Event consists of only 6-inning games. Q: If I win 12 games in the same Event entry, do I collect all of the 3, 6, 9, and 12-win rewards?